Whether your sewing skills are those of a new sewing enthusiast or you are a seasoned seamstress, this year’s contest challenges you to use your skills just a bit differently. What you create must have dual purposes, or be able to be used two ways. Need an example? Consider a scarf that can double as a table runner; jewelry that can hang on your Christmas tree; or a tote bag that becomes a jacket. There are no categories, no limitations – use your skills to be creative! Winners will be chosen at random. Maximum two photographs per entry. Photos must be in jpg or png format and must be large enough for viewing. Preferred image size is between 700 pixels – 1,500 pixels wide. Project submission must include a description of materials and techniques (machine sewing, embroidery, etc) used to create the project. Submissions must be made online at www.NationalSewingMonth.org by midnight (Eastern) on September 30, 2013. One entry per person. 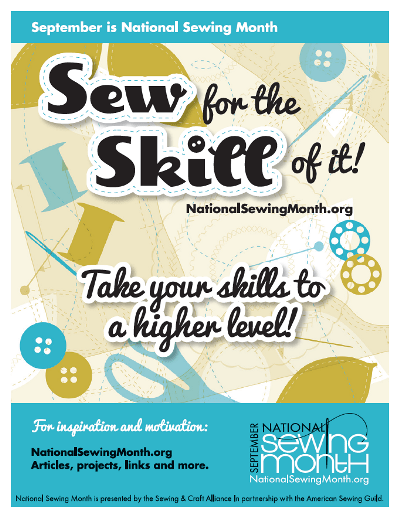 Want to get involved in National Sewing Month? Here are some great ways to get involved. Next Next post: Visit the Original Sewing and Quilt Expo with Plano ASG!